The design is an exciting, playful and dynamic structure that acts as a beacon inviting the public to the Lendlease Elephant Park development. Site option one was chosen as a gateway from Elephant & Castle and New Kent Rd arrival which also mediates between Castle Square and Elephant Park. 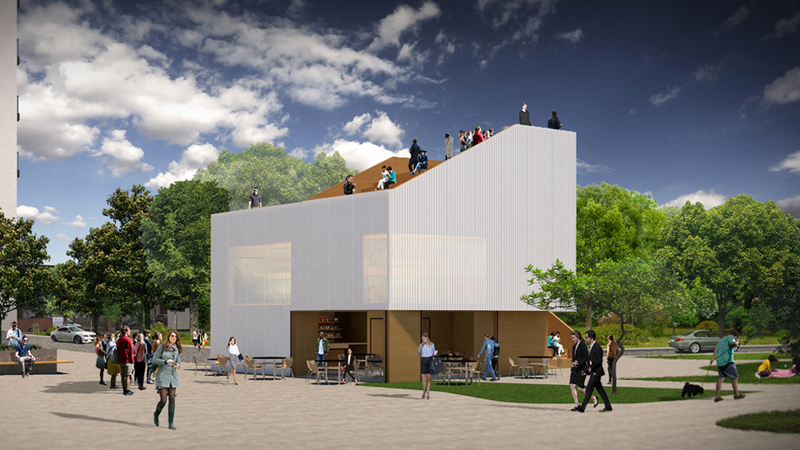 The form and axis of the pavilion were created by considering specific viewpoints required together with and how the structure relates to the park. The circulation plays a key role in the design allowing the public to meander between levels and around the structure via a series of ramps and seating steps where the public can capture ever changing views of Elephant Park from different vantage points whilst exploring the pavilion. The ground floor public space is fully open to the park with a direct relationship and entrance to the interim park path with a focus of views towards future CSS, MP2 and MP1. This area also opens out the Castle Square inviting people from Elephant & Castle arrival. A series of external steps lead to level two that splay out towards the park with seating steps providing lower level views of the park. The ground floor service area (bar, disabled WC and storage) are located towards the rear of the pavilion. Level two has been designed as a flexible exhibition/event space that can be adapted to an enclosed space. The ramp continues to level three where its orientation and views shift to arrive at this highest point where the viewing platform and stepped seating are located. The focus view from the platform is orientated towards the park, however panoramic views can be experienced from here. The stepped seating space is orientated towards Castle Square, Artworks, and Elephant and Castle arrival to experience every day and dynamic urban. Castle square could offer a backdrop for performances viewed from the pavilion. The design, construction method (using Modern Methods of construction MMC) and floor area could allow the pavilion to be demountable and re-erected for multiple uses such as community, culture, leisure or a prototype dwelling. 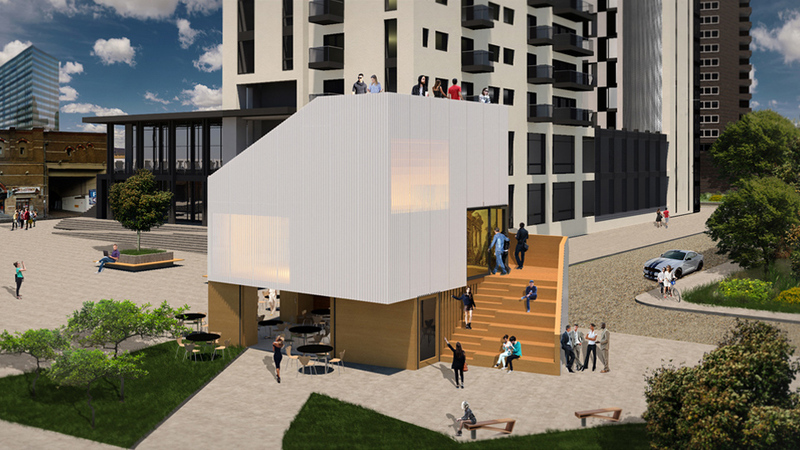 For possible future adaption to enable the pavilion to be used permanently, the pavilion’s floor area can be increased within the existing volume by inserting a mezzanine to level two together with fixing permanent rain screen cladding to the exterior.